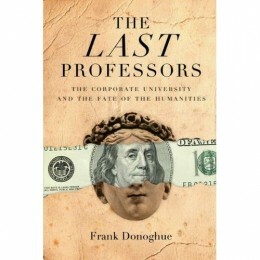 Frank Donoghue, The Last Professors: The Corporate University and the Fate of the Humanities. Fordham University Press, 2008. As soon as you spy the title’s keywords—professors, corporate, humanities—you suspect you’ve read this book before. But you haven’t. What sets Donoghue apart from the populous field of other hand-wringing institutional-critique narratives (Aronowitz, Bousquet, Giroux) is that he takes professors to task directly for our complicity in the dismal state of the twenty-first-century academy. Donoghue reiterates the grim facts we’ve all grown used to: the casualization of labour, the pursuit of institutional “excellence,” a migration of student enrolments away from humanities disciplines to science and engineering, the rise of for-profit colleges, the erosion of tenure, and corporate influence over research priorities. But then he turns his attention to how we’ve aided and abetted our own devastation, and the picture ain’t pretty. …Professions do not prepare their members to deal with layoffs, chronic unemployment, or underemployment. … When professors get fired, they cry. Moreover, no profession more fervently believes in the myth of meritocracy than academics. The conviction that somehow one’s talent alone ultimately determines one’s place in the hierarchy of academic labor gives rise to a constellation of fantasies: my charisma as a teacher will be properly valued; my completed dissertation or published book will confirm my rare intelligence. In short, someone will discover me and celebrate my intellectual powers. Since these epiphanies almost never happen, meritocracies have the effect of making everyone feel insufficiently appreciated (63). The Last Professors is equally scathing on the hypocrisy of our disavowed competitiveness. But wait: the People’s Republic of the Humanities, competitive? Donoghue puts it a little more gently, discerning “a collective behaviour that ironically duplicates the very corporate values from which we humanists wish to distance ourselves” (26). Exhibit A: graduate school, which picks the best and brightest and then drives them to despair by demanding superlative performance in “a unique kind of competition in which the stakes are extremely high and the rules are never fully explained” (33). Exhibit B is the job market, typically experienced as “an intense personal drama about individual distinction and merit” (37). Exhibit C: the still-hallowed monograph, unpurchased, unborrowed, unread, and unassailable. In all of these cases, we define success in impossible terms. And I use the first person here deliberately: there is no “they” doing this to us. Don’t believe me? Try striking up a conversation at the next academic meeting with, “We should forget about writing monographs.” It is hard not to agree with Donoghue that our research models are “clearly broken” (55). The Last Professors is at its best when it excavates the history of our current preoccupations, as with Donoghue’s discussion of tenure. After rehearsing the tedious arguments for (protect academic freedom!) and against (shed the dead wood! ), Donoghue turns to the events that led to the 1940 codification of the American Association of University Professors’ Statement of Principles, still the most-cited authority on the principles of tenure. I won’t give away the whole story, but it involves a railroad baron, a seditious speech and some powerful alumni. Donoghue’s interest is not simply in historical storytelling. By putting a sacred tenet into historical context, he opens it up to question and critique. The mid-twentieth century saw the solidification of university teaching staff into a coherent system of assistant, associate and full professor—and then (here is Donoghue’s contribution) the disintegration of that system into a jumble of low-cost, disposable adjuncts, part-timers and contract academics. In this context, Donoghue argues, tenure conceived as the protection of academic freedom does not matter: it simply does not apply to the majority of people who staff university classrooms. In fact, he goes so far as to suggest that insofar as the tenure system presupposes a vulnerable pre-tenure period of seven years, it is part of the problem. “So it is that we romanticize our jobs and fail to recognize how the tenure process works to deaden the possibility of radical freedom of expression” (77). He draws back from this strong position a little on the next page, stating that we should not exactly disparage tenure—but insofar as it applies to a minority of workers in the twenty-first-century academy, it is profoundly beside the point. So what’s “on point” for Donoghue, ultimately? First, he would have us see ourselves as we really are: thoughtful and well-meaning agents caught in a system that constrains our best intentions at every turn. Then he would have us think boldly and collectively. This would mean giving some things up: the phantasm of tenure, the comforts of merit, the pieties of monastic research. It follows (though he does not actually say this) that we would have to rationalize our workload and demystify some of its machinations and expectations. We need to continue resisting corporate incursions, but not by pretending that we are holier. Instead, Donogue insists, we need to understand corporate logic and its contradictions—for instance, how the holy grails of efficiency and prestige work at cross purposes—so that we can strategize how to challenge corporate assumptions effectively. Ultimately, I’m not sure whether Donoghue’s challenge will be heard. Those who like a crisp enemy—the administration, managerialism, corporatization, anti-intellectualism, conservatism—will dislike this book. In addressing not just the conditions of our work, but also the fierce yet disavowed preconditions of professorhood, Donoghue calls for a lot. Institutional changes alone are insufficient, he opines: “We would also need to renounce the values that we think of as alien to the humanities, but that have nevertheless insinuated themselves into our profession and now control how we do our jobs” (26). Can professors in the humanities admit to careerism, ambition, competition, and a belief in merit? Even shattering the shibboleth of our altruistic service to students and knowledge—our noble vocationalism—sounds simple next to the final challenge Donoghue utters. “For professors to … forestall their own extinction, they must first become not only sociologists but also institutional historians of their own profession” (138). They might even have to serve on a committee. Associate Professor of English and Associate Dean (Graduate Studies) at the University of Alberta, Heather Zwicker locates her work at the crossroads of postcolonialism, cultural studies and feminism. Early research investigated the meanings of nation and nationalism for women writers from Canada and Northern Ireland. More recently, she has turned her attention to questions of university governance and administration, as well as public intellectualism. In this realm, she has edited Edmonton on Location (NeWest Press, 2005) and co-edited Not Drowning but Waving: Women, Feminism and the Liberal Arts (University of Alberta Press, forthcoming). She is the founding Board Chair of Exposure: Edmonton’s Queer Arts and Culture Festival.